Alex MacDonald in action at Exeter. 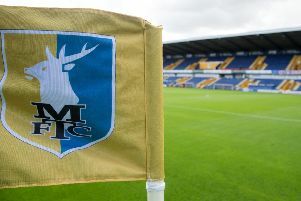 Alex MacDonald says he and his fellow Mansfield Town players are full of confidence and excitement as they aim to end the season with promotion. MacDonald has returned to the Stags setup in recent games following a spell out injured, playing a key part in last Saturday's 4-1 win at Exeter City. And, while reflecting on that success, MacDonald has said that the vibe around the club is very positive. “After a couple of away games without a win it was important to go there and get a result as it’s a tough place to go. I’ve been there in the past and it really can be a tricky place to play. “We had a great record on the road earlier in the season and needed to get back to that. “Being back in the starting line-up had been a long time in coming. I’d had a bit of a taster in the week at Crawley but it was just great to be back. “I must be doing the manager’s head in as I’m trying to get back in the team and am desperate to be back out there and help the lads out." Attention now turns to this weekend's visit of Cambridge United as Mansfield look to regain their top three place. And MacDonald says he now wants to see a similar display to that which was produced by the Stags last weekend. He said: “It’ll be great to be back in front of the home fans against Cambridge. It’s been a long time since I’ve played a game from the start here so hopefully I’ll get selected and help the team apply ourselves like we did last weekend. “The boys are excited ahead of the run-in. The win last week created a real spring in our step and there’s a lot of confidence running through the camp. “It’s a busy time over Easter but we’ve had a couple of week-long breaks so we should be fresh enough for the challenge.